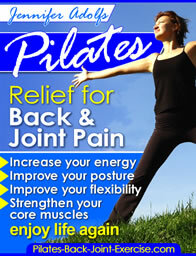 Doing hip exercises for women is quick, efficient, and effective when you use the Pilates for hip side kick sequence. As women we are all looking for long streamlined legs, especially through our hips and thighs. Using these Pilates techniques shown in this video you will find the best way to do hip strengthening exercises. Keep your waist long and lifted off the mat or floor. Lengthen your spine and the leg you are working as go through the exercises. Keep your torso still and neck long. Breathe in as you reach and extend and exhale as you bring the leg back towards the center of your body. Move with energy and control. You can find more Pilates Side Kick hip exercises for women here. Some of you may find lying on your side doing Pilates side kick exercises may be uncomfortable, especially if you are on a hard floor and have bony hips like me! If so, try these hip strengthening exercises standing. They are just as effective and maybe more with the added challenge of having to balance in a weight bearing position. The standing hip abduction exercise shown here to the left is a good Pilates hip exercise. It helps to stabilize the pelvis while mobilizing the thigh at the hip joint. Standing tall with your shoulders right over your hips and balanced on one leg. Begin to kick or slide the other leg out to the side without bending to the other side. You will feel the muscles in your thigh tighten so you can't kick it out any farther without bending. Repeat this Pilates for hip standing exercise for 8-10 repetitions on each side. You can add circles and front and back swings to this exercise just as we did in the side lying position. Find these and many more free articles and hip exercises for women on this page.